This is my auction. It is fair to say, this is the best auction on eBay since April 2012. No question. I considered paying to have the auction list at a certain time. I forgot about that choice. I didn’t think it was worth it this time. I don’t care that much. This auction is more experiment than an attempt to maximize the final price. However, listing the figures made me think their should be a third rule: the 1/15 weekend rule. If you’re selling something good, then have it end on a Friday or Saturday night. I know that idea isn’t perfect globally, but still shoot for weekends. If you have something really good, then, even more specifically, aim for the 1st and 15th of the month. To be clear, that’s not a welfare joke. But people feel more comfortable spending a little bit more when they have been recently paid. All of those things help to maximize the tiny M.U.S.C.L.E. audience. 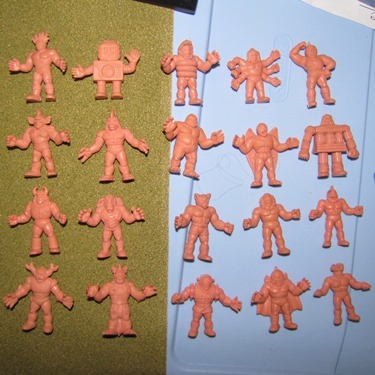 My two other basic M.U.S.C.L.E. selling rules are: (1) low opening bid (ideally $0.01) and (2) a clear picture. These figures aren’t anything special. They are an average lot of figures, in fine/decent condition. 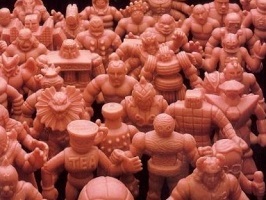 They are the #180 of M.U.S.C.L.E. lots. I am curious to see the end result. Anyone want to take a guess? 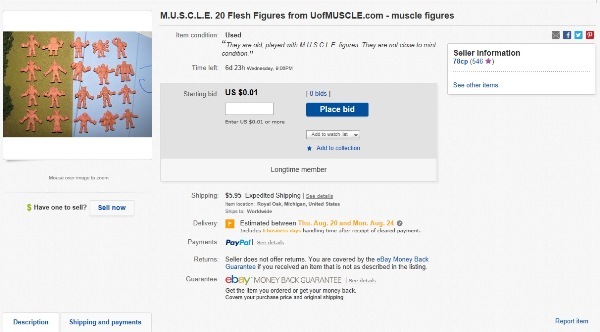 Economics, Economics 100, Flesh Figures, How Much Are M.U.S.C.L.E. 's Worth? This entry was posted on Thursday, August 6th, 2015 and is filed under Economics, Research, UofM News. You can follow any responses to this entry through RSS 2.0. You can skip to the end and leave a response. Pinging is currently not allowed.